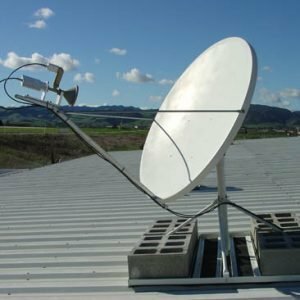 VSAT is a way of providing better connectivity to the internet or for private satellite communications networks in areas where there are unreliable communication networks. Depending on bandwidth requirement (data speed and/or communications channels) VSAT systems can be relatively small (1 to 2.4 meter antenna) and easily installed. By linking VSAT terminals to larger hub stations (or land earth stations) a wireless network can be established at relatively low cost. A VSAT is a small fixed or mobile system which provides a communication link to a satellite which can handle data traffic. It is basically a satellite internet connection. Depending on which satellite is used, the signal will be transmitted to a particular earth station with a direct link to an Internet backbone. This means that even in countries which have no direct access to these backbones (like many African countries) a one-stop (one hop in technical terms) connection to the main data routes of the Internet can be established. VSAT systems offer value-added satellite-based services capable of supporting the Internet, data, LAN, voice/fax communications and can provide powerful, dependable, private and public network communications solutions. A VSAT has certain clear advantages over leased lines and other wireless communications media as it is less sensitive to physical damage like cable theft, breakages and lightening/surge.